Progress/Under Erasure re-presents in a new edition two innovative long poems by one of the best-known poets and critics associated with “Language” writing. Upon its original publication in 1985, Progress was greeted with enthusiasm and public debate. Its linguistically charged, emotionally relentless, and culturally reflexive nonnarrative form was pitched against the media saturation and political banality of the Reagan era. 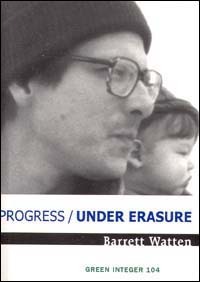 If Progress is a nonnarrative directed toward the end of history, Under Erasure (published in a limited edition in 1991) was written during its purported realization at the end of the Cold War in 1989, and event it records.